Russian engineering enterprise Kuznetsov and U.S. corporation Orbital Sciences have entered into an option agreement to supply 50 NK-33 rocket engines to the United States by 2020. Two modified NK-33 engines are currently being used in the first stage of the Antares launch system developed by the United States to deliver cargoes to the International Space Station (ISS). The initial launch of Antares is scheduled for this year. 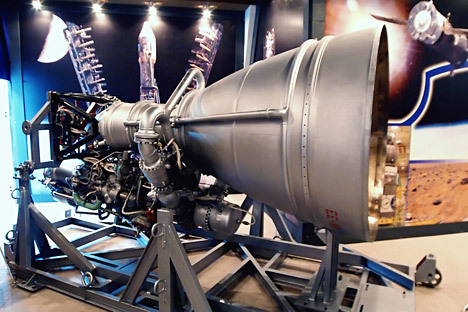 The NK-33 engine has been around for a while, as it was created for the N-11 launcher that was supposed to take Soviet cosmonauts to the moon. However, this project was discontinued in 1974. Currently, the NK-33 is used in the first stage in the new Russian light carrier-rocket Soyuz 2.1v, whose inaugural flight is also expected to take place this year. New Russian space initiatives outlined shortly after New Year show promise for breakthroughs in the country’s space industry in the next few years. One of the most pertinent issues is upgrading launch vehicles, which not only ensure independent access to outer space for Russia, but also represent a valuable asset in the global commercial launch services market. RD-180 – the country’s signature rocket engine abroad – is produced by Russia’s biggest manufacturer, NPO Energomash. According to Energomash’s international business director, Anatoly Frolov, the company’s budget is 75-80 percent composed of export revenues from RD-171 and RD-180 engines. The former model is supplied to Ukraine, which produces Zenit launch systems lying at the heart of two international programs – Sea Launch and Land Launch. RD-180 has been designed on the basis of the RD-170 engine used in Energia and Zenit launch pads. Unlike the four-chamber RD-170, RD-180 has two combustion chambers and a new, less powerful turbopump unit driven by a single gas generator. RD-180 produces a thrust of 400 tons. The beginning of 1996 was marked by a truly unprecedented event: the RD-180 engine design won the bid for equipping the first stage of the U.S. carrier Atlas, which was developed by Lockheed Martin Corp. In spring 1999, the Americans certified the engine for use in their launchers. The first launch of Atlas with the Russian engine took place in August 2002. Today, RD-180 makes up part of the latest American launch system Atlas V, which is used extensively for delivering payloads that are of interest to U.S. government agencies and, in particular, to the Department of Defense. According to Energomash CEO Vladimir Solntsev, the company is expected to supply about 30 RD-180 engines to the United States over the next five years. The contract between the U.S. and Russia envisions supplying a total of 101 engines. So far, the United States has procured 63 units. It should also be noted that the Americans were initially planning on starting production of this model themselves, once the first 50 units had been received. However, the program was closed down after a detailed study had found it was unfeasible. New Energomash clients from Japan have decided to pursue a similar strategy. The bilateral Galaxy program stipulates that Japan purchase a number of Russian engines to be upgraded under its guidance. The Japanese were initially hoping to build their own engine, but they eventually opted to buy the U.S.-made Atlas rockets furnished with Russian engines. Energomash also cooperates with the European Space Agency on developing the engine for a prospective reusable launch system. Currently, this work is being implemented within the framework of the Ural project. However, the parties have not yet come to any definite conclusions about the fuel that the future carrier will use. For the time being, several options are being considered, including the traditional liquid oxygen and kerosene mix with methane. The comprehensive space cooperation program between Russia and Brazil seems to have a very promising future, too. It is highly probable that Russia will supply the entire Angara launch site to its Brazilian partners. In the beginning, Brazil was planning to build its own fleet of rocket carriers after it had successfully deployed a space launch facility. However, technical difficulties urged the country’s leaders to address Russia.